Thanks to Abbott for their expo photo booth. Not often we get a chance to have a professional photo taken. Dr. Westgard talks about the new era of QC at the Thermo Fisher workshop. Visit our booth or better yet Thermo Scientific's booth for a nice take-home from Chicago. Method evaluation accomplished. Thanks to AACC President-elect Dave Koch and Nils Person, my co-presenters, and to all the attendees who braved a day of statistics. Westgard QC is proud to announce the publication of its tenth reference manual: Basic Quality Management Systems. For laboratories in the US, it's become abundantly clear that compliance is not the path to competitiveness. For labs that want to distinguish themselves from their rivals, a higher level of quality must be achieved, an approach that doesn't tackle different processes piecemeal, but assembles them all into one coherent system: a Quality System. 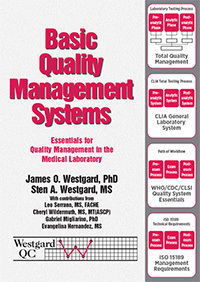 Dr. Westgard explains the ISO 15189 standard, the CLSI guidelines, the WHO/CDC training tools, and more, in this plain-language, practical guide to quality management. Is your lab ready to upgrade from compliance to a culture of continuous improvement? Continuing in our analysis of the 2014 Lenters-Westra and Slingerland study on HbA1c quality for POC devices, Dr. Westgard digs into the data on the performance of 7 different point-of-care HbA1c devices and measures their performance on the Sigma Scale. 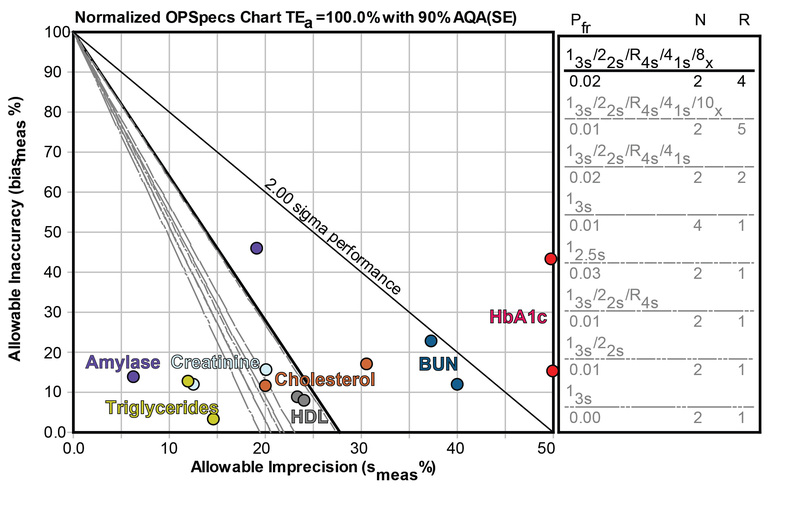 Using a Sigma-metric Method Decision Chart, you can make an easy visual assessment of which methods assure the quality of the intended use of the test. In 2010, Lenters-Westra and Slingerland looked 8 different POC devices and the Decision chart had many methods missing the target. Has the quality of HbA1c devices gotten better since then? 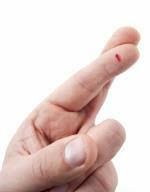 How many HbA1c devices do you think can hit the bull's-eye? Or even just the outer ring of the target? Compact chemistry analyzers continue to be introduced into the marketplace. We take a look at a new study of the latest entry and examine the performance of 6 common chemistry tests as well as HbA1c. When authors claim that performance is "suitable" and/or "acceptable", what does that really mean? Suitable for what? Acceptable to whom? Our evaluation uses the Sigma Scale, giving an objective benchmark for the device's performance. Do patients want results in half the time but with twice the imprecision? They interviewed me after my presentation at the Abbott Industry workshop - during the IFCC WorldLab conference. The focus was on "Westgard Rules" and quality in laboratory medicine and the challenges facing laboratories worldwide. The Bobblehead Raffle is Back! The Bobblehead Raffle is Back again! As part of our annual tradition while exibiting at the AACC/ASCLS conference, we will again be offering the "Westgard Wear" Raffle: your chance to win rare (obscure) objects of quality control gear. As we must always note, these products are not sold in stores - they're too strange and no normal store would be willing to offer them. However, winning one of these bobbleheads is the quickest way to a lab geek's heart. Join the membership of Westgard Web (if you're not already a member). Anyone joining the membership between July 25th and August 30th will be automatically entered in the raffle. If you are already a member, just email raffle@westgard.com to make your entry. You can mention the "Westgard Wear" raffle in the subject line if you wish, but just sending to that email address is enough. only 3 prizes will be awarded to the online raffle, which may seem like a small number, but that probably still gives you odds of about 1 in 100, which seems to us to be better than the odds of most casino or lottery gambling. It's that time of year again, the annual Laboratory Exposition at the conference of the AACC and ASCLS, this year held in Chicago, Illinois. Westgard QC will be exhibiting at Booth 4320 in Sweet Home Chicago. We invite you to drop by and see us. This will be your first chance to get your hands on a copy of Basic Quality Management Systems, the new reference manual on QMS for medical laboratories. We will have all of our other reference manuals as well some new developments around the "Westgard Rules" - you'll have to be there to see it! So look for this sign, stop by, and share your laboratory story. We look forward to the chance to meet you, chart, and understand your challenges.